As we close out 2015, we would like to CELEBRATE the work of the iGEM 2015 teams, make several ANNOUNCEMENTS, and wish you a HAPPY HOLIDAY season before ringing in the new year and getting excited for 2016! We would like to once more congratulate all the iGEM 2015 teams. 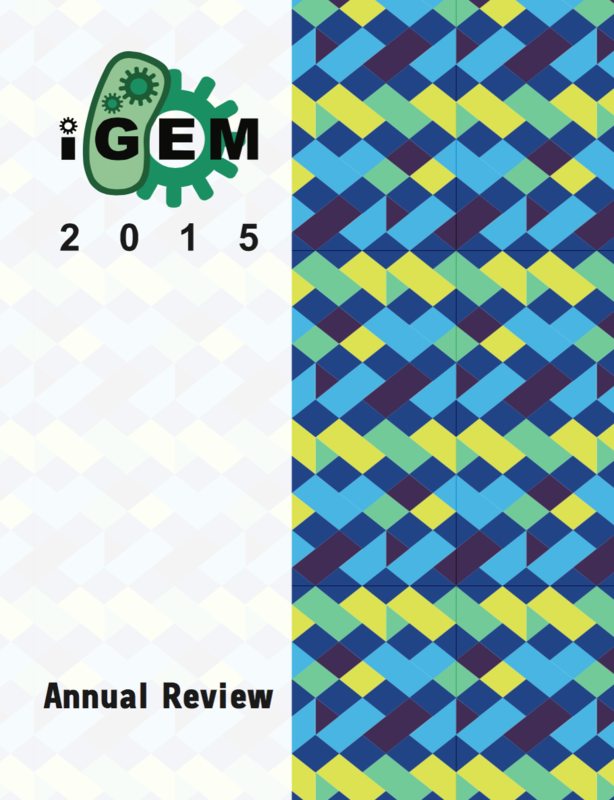 For a recap on the iGEM 2015 season, check out our 2015 Annual Review at: 2015.igem.org/Annual_Review. The iGEM 2016 main page is now live! Be sure to bookmark it and check back often for news and updates. We are very pleased to welcome high school teams back as a part of the main competition again! High school teams made an impressive showing at the Giant Jamboree and we look forward to their participation in 2016. High school teams, keep reading for a note on registering as a “kind” of team. Community Labs have been a delightful addition to the competition. We recognize that these teams are just like other iGEM teams in the types of projects they work on and a dedicated Community Labs track is perhaps not the right format. As such, we are happy to announce that Community Labs teams will participate in the competition as a “kind” (see below) and can choose a track of their preference just like other iGEM teams. However, these teams will have to fulfill additional registration requirements! Registration will open at the beginning of February. Teams will register as one of three team “kinds”: Collegiate, High School, or Community Lab. Each kind of team will have different registration requirements, for example: consent forms for high school teams and facility safety requirements for community lab teams. The requirements for participation in iGEM 2016 have been posted. All team members (students, advisors, and instructors) should read and be familiar with the requirements. These should serve as your guide on how to do iGEM. And remember, your team will not be eligible for awards and prizes if you don’t comply with the requirements. Read the requirements at 2016.igem.org/Requirements. The Regular Team Registration Fee for iGEM 2016 will be $4500. The Giant Jamboree Attendance Fee will stay the same and be $695 per attendee. These are the fees regardless of team kind or region. More details about fees, including instructions on how to pay, will be provided closer to the opening of iGEM 2016 registration. Due to current restrictions by the Chinese Inspection and Quarantine Services (CIQ) iGEM is currently unable to ship DNA distribution kits or part requests to China. We must ask teams from China to please plan accordingly. And with these announcements, we hope you look back fondly on iGEM 2015 and get excited for iGEM 2016! Please note the iGEM office will be closed for the holidays from December 24 through January 4. Want to stay current on what is going on in both the iGEM community and the broader synthetic biology community throughout the year? Check out the new iGEM Community Bulletin page. A symposium titled "Mining Microbial Diversity for Pleasure and Profit" is being organized at the Microbiology Society Conference in Liverpool, UK from March 21-24, 2016. iGEM 2015 teams from UK and Ireland are invited to attend and show their work to a wide audience. Submit your materials by December 25. Have something to share with the community? Feel free to email us at hq (at) igem (dot) org!